• Camp under the stars in the shadow of mountains. 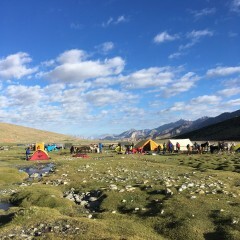 After an early breakfast in the hotel, you are driven to the start point of the Markha Valley trek at Zingchen village. The trek starts in the beautiful Hemis National Park, and you'll come to appreciate its immense size as you walk through it. You'll only be trekking for 4-5 hours today, just enough to warm up those trekking muscles. You'll traverse a narrow trail which widens out to reveal a dramatic valley and the village of Rumbak. 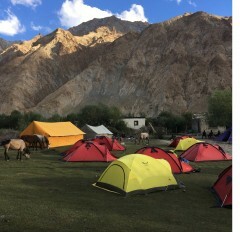 From Rumbak you trek to the nearby village of Yurutse where you’ll spend the night in tents, camped at the foot of the Ganda-La pass. Wake up early to a hearty breakfast under the open skies, and get ready to ascend to Ganda-La. You'll wind your way along steep mountains, cross a valley, and zigzag up to the pass, which stands high at 14,370 feet. From the top, you'll get spectacular views of the surrounding region of Ladakh and of Markha Valley, where you’ll be camping for the night. You'll have some time to explore the pass and the views, and then will proceed onwards to the village of Skyu, in the Markha Valley. At camp, you'll eat a hot dinner and retire to your tent for the night. Wake up to a cup of hot tea or coffee and a big breakfast. Today's going to be a long trek of about 7 hours, but it'll be fun, because you'll be crossing the Markha river twice during your trek. During this time of the year, the river is shallow, but the current is strong and the riverbed is slippery, so watch your step. You'll pass through Chaluk, where you rest and recover before continuing along the banks of the Markha river to the climb that leads you to Markha village. You'll be camping here for the night. You'll wake up and enjoy a big breakfast and a lazy morning, before it's time to set off on your next adventure. The trek continues through the valley, with barren mountains framing the blue skies and the occasional grassy plain. You take a break at Hankar village, where you get a chance to rest your feet and refuel with some food and drink. After that, you'll trek onwards till you reach Thachungtse, where camp is set up for the night. Overnight in tents. Today you'll ascend from the plateau from Thachungtse to an altitude of 16,000 feet. The ascent is a steep one but the alpine grasslands in Nimaling are worth the effort. In these vibrant pastures, you’ll find shepherds minding herds of grazing yak, goat, and sheep. Also, in the background is the Kang Yatse peak with its two summits. You'll be camping here for the night. After breakfast at camp, you set off to conquer Kongmaru-La pass. The trek to the pass is a thrilling one, with deep gorges and narrow trails leading to dramatic reveals of hidden valleys. The Kongmaru-La pass is one of the higher mountain passes, situated at 16,700 feet, and offers sweeping views of the Indus valley, dotted with quaint villages and patches of grassland. After you’ve had your fill of the summit, you continue onward to Shang Sumdo, which is situated at a height of 12,000 feet. This will be your last night in the tents and in the great outdoors, so make sure you make the most of it. Overnight in tents. Overnight in 2 person alpine tent. After breakfast at the hotel, you're transported to the start point of the Markha Valley trek in private shared vehicles. Lunch is provided enroute, and you'll stop at a campsite for the night. You'll be given sleeping bags and mattresses in your tents. Today's package includes all meals. Start the day with a bracing breakfast, to fuel you through the trek. During camping, you'll have toilet tents, a kitchen tent, and camping chairs and tables for your convenience. Lunch is served mid-trek at a suitable location. Today's package includes all meals. At the end of the day you have a hearty dinner before sleeping in your cozy tents. Start the day with a bracing breakfast, to fuel you through the trek. Today's package includes all meals. Lunch is served mid-trek at a suitable location. At the end of the day you have a hearty dinner before sleeping in your cozy tents. Start the day with a bracing breakfast, to fuel you through the trek. Today's package includes all meals. Lunch is served mid-trek, with dramatic views all around. At the end of the day you have a hearty dinner before sleeping in your cozy tents. Start the day with a bracing breakfast, to fuel you through the trek. Today's package includes all meals. Lunch is served mid-trek at a suitable location. At the end of the day you have a hearty dinner before sleeping in your cozy tents for the last time.